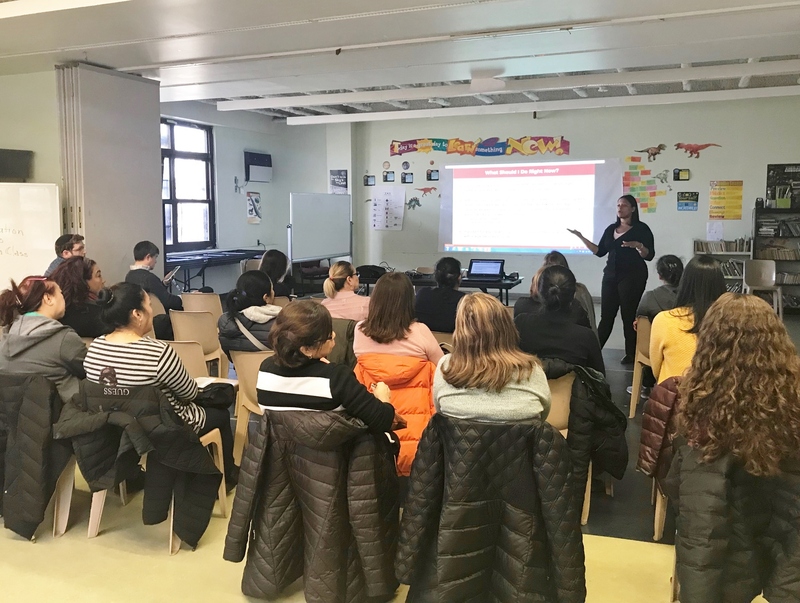 On December 4 and 5, our staff partnered with The New York Immigration Coalition (NYIC) to organize public forums in both Jackson Heights and Forest Hills on the new "public charge" rule published by the Department of Homeland Security. Public charge is essentially a 'test' that determines if someone is likely to become dependent on specific government programs. An immigrant who is found to be "likely . . . to become a public charge" may be denied admission to the U.S. or lawful permanent resident status. While the proposed rule is not current law and we are many steps away from a final rule, its proposal has resulted in increased fear and stress across our immigrant communities. Our SNAP (Supplemental Nutrition Assistance Program) staff, for example, are communicating that even working households who are eligible for SNAP are declining to apply. This will cause a financial burden to the household and will also have a negative impact on the local economy. If the proposed changes to the rule are finalized, legal immigrants will be at serious risk of being unable to renew their visas or become permanent residents if they apply for certain federal assistance programs or are low-income, hurting whole families and communities. It is at the core of QCH to advocate and support our communities, in this case, by sharing accurate information about the public charge, by encouraging people to take action and comment on the rule until December 10, and by letting people know about the services and resources that they can access through our organization and the broader community. Both forum sessions were focused on the concept of public charge and who is affected/will be affected by the potential changes to the rule. They also provided specific information about which public benefits are currently tested by the public charge and which will be added to the list if the changes are approved. "People were very interested and engaged. The atmosphere was extremely safe which allowed everybody to openly express and ask meaningful questions about their own legal status in relation to their public benefits and the public charge rule," said our Community Engagement Coordinator, Julieta Larsen. "It was surprising and amazing to see how, at the end of each presentation, most of the participants expressed that they were misinformed - and in some cases a bit confused or stressed - about the real impact of the changes to the public rule and their legal situations. Many participants shared their common concerns and were able to clarify their doubts when our NYIC presenter provided accurate information about specific public benefits and cases that the rule, and the potential changes to it, may apply to." Want to join our efforts in supporting Queens immigrants? Federal law gives all of us a chance to fight back, by submitting a "public comment" on the proposed regulation. The government must consider each comment and either explain why they disagree with it or change the rule. People can submit their comments until December 10th on https://www.ouramericanstory.us/.